I photograph several weddings at Sherwood Country Club and every one of them seems to be more amazing than the last. 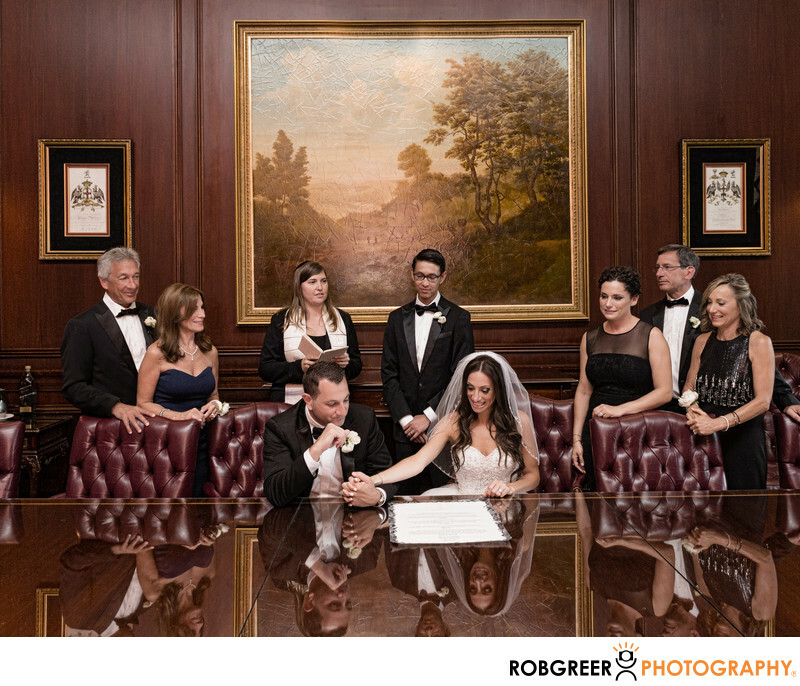 This photograph of the bride, groom, bride's parents, groom's parents, made of honor, best man, and Rabbi is one of my favorite Ketubah signing photographs of all time. I particularly enjoy the reflections in the foreground as well as the poignant moment of the groom holding the bride's hand as they review the document. The dark table, dark chairs, and woodpaneled walls all complement the richness of the scene. You will also note the perfectly positioned individuals in this photograph. I did not direct their position in any way, which in itself makes the overall scene quite remarkable. In many cases when I'm photographing this Jewish tradition, the room being used for the ceremony is unattractive or overly crowded or the participating individuals are seated or standing in positions that aren't visually appealing — at least from a photographer perspective. And yet all of those things come together perfectly for this photograph. There is one piece of advice that I should offer for this conference room at the Sherwood Country Club and that is that the room is extremely dark and requires care when using on-camera or off-camera flash. The only window in this room, which is position to the right of the subjects, is only suitable for my natural light perspective when the subject is near the window. Otherwise the dark surroundings completely overpower this natural light source. Sherwood Country Club is located in Thousand Oaks, California. Phone: (805) 496-3036. Website: http://www.sherwoodcountryclub.com/. Contact Person: Heather Sims, (805) 267-4545, hsims@sherwoodcc.com. Keywords: Sherwood Country Club (9). 1/80; f/5.0; ISO 1000; 24.0 mm.